Pedestrians were one of the few groups of road users in the United States to experience an increase in fatalities in 2016, totaling 5,987 deaths. In 2016 there were 5,987 pedestrians killed (Table 1) in traffic crashes in the United States. A total of 5,900 traffic crashes (Table 4) had one or more pedestrian fatalities. On average, a pedestrian was killed every 1.5 hours in traffic crashes. On average, a pedestrian was killed nearly every 1.5 hours in traffic crashes in 2016. In 2016, one-fifth (20%) of the children 14 and younger killed in traffic crashes were pedestrians. More than two-thirds (70%) of the pedestrians killed in traffic crashes were males in 2016. Alcohol involvement—for the driver and/or the pedestrian—was reported in 48 percent of all fatal pedestrian crashes in 2016. 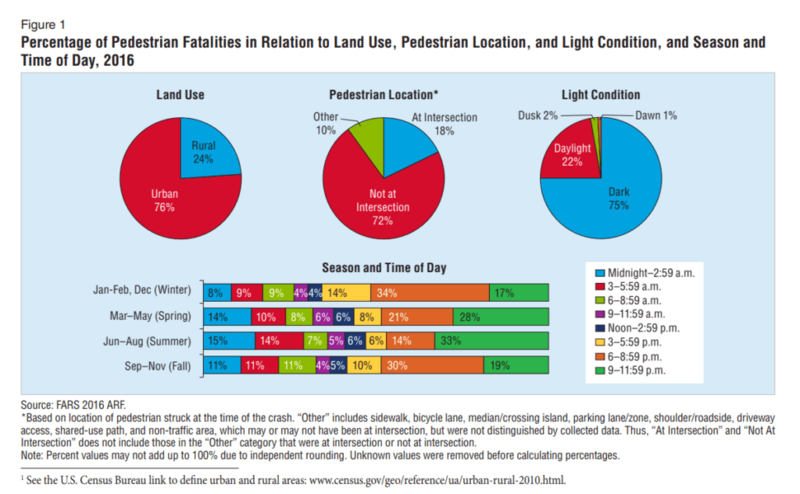 More pedestrian fatalities occurred in urban areas (76%) than rural areas (24%). Fewer pedestrian fatalities occurred at intersections (18%) than at non-intersections (72%); the remaining 10 percent occurred at other locations such as roadsides/shoulders, parking lanes/zones, bicycle lanes, sidewalks, medians/crossing islands, driveway accesses, shared-use paths/trails, non-traffic way areas, and other sites. More occurred in the dark (75%) than in daylight (22%), dusk(2%), and dawn (1%). Look out for pedestrians everywhere, at all times. Safety is a shared responsibility. Use extra caution when driving in hard-to-see conditions, such as nighttime or bad weather. Slow down and be prepared to stop when turning or otherwise entering a crosswalk. Yield to pedestrians in crosswalks and stop well back from the cross-walk to give other vehicles an opportunity to see the crossing pedestrians so they can stop too. Never pass vehicles stopped at a crosswalk. There may be people crossing that you can’t see. Never drive under the influence of alcohol and/or drugs. Follow the speed limit, especially around people on the street. Follow slower speed limits in school zones and in neighborhoods where children are present. Be extra cautious when backing up—pedestrians can move into your path. Be predictable. Follow the rules of the road and obey signs and signals. Walk on sidewalks whenever they are available. If there is no sidewalk, walk facing traffic and as far from traffic as possible. Keep alert at all times; don’t be distracted by electronic devices that take your eyes (and ears) off the road. Whenever possible, cross streets at crosswalks or intersections, where drivers expect pedestrians. Look for cars in all directions, including those turning left or right. If a crosswalk or intersection is not available, locate a well-lit area where you have the best view of traffic. Wait for a gap in traffic that allows enough time to cross safely; continue watching for traffic as you cross. Never assume a driver sees you. Make eye contact with drivers as they approach to make sure you are seen. Be visible at all times. Wear bright clothing during the day, and wear reflective materials or use a flashlight at night. Watch for cars entering or exiting driveways, or backing up in parking lots. Avoid alcohol and drugs when walking; they impair your abilities and your judgment. If you’re an advocate of pedestrian safety, or perhaps you work on a State or local pedestrian program, the NHTSA provides additional curriculum and resources to equip you with the tools and information you need to effectively promote pedestrian safety.